With the New Year comes a time of reflection. Looking back at the past years triumphs and mistakes and making plans for the coming year. And it’s important to not beat yourself up for mistakes but to take them as lessons learned. 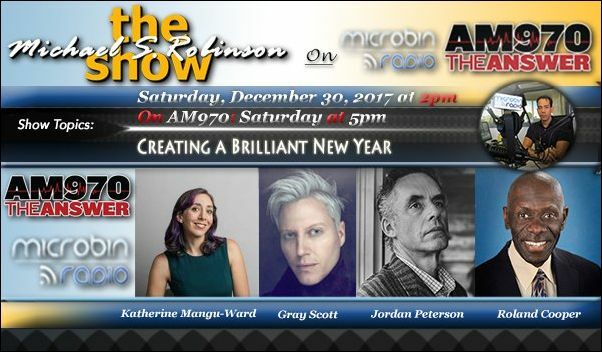 Michael Robinson interviews his guests as they share ideas, thoughts and information to help you steer 2018. Reason’s editor-in-chief, Katherine Mangu-Ward talks about the positives she sees in the coming year from jobs to climate change to sustainability. Futurist Gray Scott talks about how the evolution of technology will further affect displacement in the workforce and how he see it balancing out. Each year our lives don’t seem to be getting that much easier with new forces bringing chaos into our environments. Jordan Peterson talks about how can we set goals to help navigate these chaotic waters. And what is the key to living our best year yet? Inspirational speaker Roland Cooper shares his ideas on how best to sharpen your focus to meet your most wanted goal.